IRVINE, CA--(Marketwire - Sep 11, 2012) - Toshiba America Information Systems Inc., Telecommunication Systems Division (Toshiba) -- www.telecom.toshiba.com, has helped LifeLong Medical Care connect the employees and patients of its network with Toshiba's IPedge® and Strata® CIX™ IP and converged business telephone systems. Founded in 1976, California-based LifeLong Medical Care is a dynamic nonprofit community organization with locations in Alameda, Contra Costa and Marin counties. LifeLong provides approximately 233,720 health care visits annually to more than 41,000 individuals of all ages, many with complex health conditions. Support LifeLong's mission to provide the highest possible quality of service to its patients and their families. LifeLong's Authorized Toshiba Dealer, ATS Communications Inc. of Concord, Calif., installed and provides service support for the system. Sanford Gladding, sales manager of ATS Communications, said, "With Toshiba's migration promise to 'Leave no customer behind,' Toshiba's IPedge and Strata CIX meet LifeLong's communications needs both today and into the future." ATS Communications has been an Authorized Toshiba Dealer since 1988. Network eManager® for centralized remote management of all systems in all locations. Toshiba met LifeLong's requirement for a centralized system with shared applications across all locations, including voice mail, call center and remote system management. Using Toshiba's Network eManager remote administration tool, LifeLong's IT staff can now remotely manage the entire telephone system from their desktop or laptop computers. LifeLong's locations are seamlessly networked via IP using Toshiba's Strata Net IP networking solution. Networking the systems enables direct extension dialing and call transfers between the locations, helping reduce long distance charges by thousands of dollars every month. And, it's helped improve communication between both the internal staff and their patients. Utilizing IP telephones has helped LifeLong cut its cabling costs for their new construction in West Berkeley by 50 percent. As well, during construction, IP telephones have enabled staff to move easily and take their IP telephones with them. Standardization on a single vendor platform for all locations. "Together, Toshiba and ATS Communications delivered on our primary goals of centralized applications, IP networking between all locations, and the ability to do remote system administration. With Toshiba and ATS, we have a winning combination," said Betsy Ami, IT director, LifeLong Medical Care. "Our Toshiba business telephone system is extremely reliable and easy to use, allowing us to focus on our patients and staff while providing the best communications solutions possible," added Phillip Klatt, IT manager, LifeLong Medical Care. Headquartered in Irvine, Calif., TAIS is comprised of three business units: Digital Products Division, Imaging Systems Division, and Telecommunication Systems Division. Together, these divisions provide digital products, services and solutions, including industry-leading portable computers; televisions, TV/DVD Combination products, Blu-ray Disc and DVD products, and portable devices; imaging products for the security, medical and manufacturing markets; and IP business telephone systems with unified communications, collaboration and mobility applications. TAIS provides sales, marketing and services for its wide range of products in the United States and Latin America. TAIS is an independent operating company owned by Toshiba America Inc., a subsidiary of Toshiba Corporation. © 2012 Toshiba America Information Systems Inc. All rights reserved. All product, service and company names are trademarks, registered trademarks or service marks of their respective owners. Information including, without limitation, product prices, specifications, availability, content of services, and contact information is subject to change without notice. 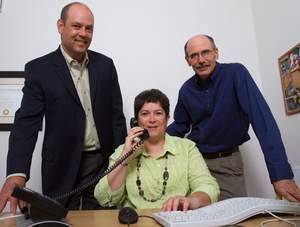 Betsy Ami and Phillip Klatt of LifeLong, at right, with Sanford Gladding of ATS, appreciate their centralized Toshiba business telephone system, which networks their locations over IP for cost savings and improved productivity.